Many of the patients I see with shoulder pain have injured themselves as the result of strenuous, weight-bearing exercise. As high impact, strength-related exercise programs have increased in popularity, many people are putting too much weight on their shoulder joints. While the benefits of exercise are indisputable, it is important to understand how the shoulder works and how best to avoid injuring this delicate joint. The shoulder is built for range of motion rather than stability. It is a ball-and-socket joint held in place by a thin sleeve of muscles and tendons called the rotator cuff. Excessive weight on the shoulder can damage the cuff as well as other soft tissues around the joint. Exercise programs that work the large chest and back muscles should also include exercises with light weight or elastic bands for the smaller rotator cuff muscles. If you feel shoulder pain when exercising or playing sports, DO NOT WORK THROUGH THE PAIN. Rest your shoulder for two weeks and take over-the-counter anti-inflammatory medication such as ibuprofen, if necessary. If, after two weeks, you return to your activity and still feel pain, you should consult an orthopedist. Repetitive or continuous use of the shoulder at a young age can lead to injury. Children under the age of 16 should avoid playing any single sport for more than 8 months of the year, especially swimming, baseball or tennis, to prevent shoulder overuse. Heavy weight training is also a potential cause of injury. Danbury Orthopedics, a member practice of OrthoConnecticut, offers an expert group of orthopedic specialists, including a team of sports medicine doctors who work with sports-related injuries and conditions of all kinds. The practice has its own x-ray, MRI and on-site physical therapy specialists, allowing patients to recover in one single, integrated location. All the practice’s physicians are fellowship-trained, and experts in their specialty area. Dr. Albert Diaz, who is a fluent Spanish speaker, specializes in the field of sports medicine, minimally invasive arthroscopic shoulder and knee surgery. He completed his sports medicine fellowship at the Minneapolis Sports Medicine Center where he served as Assistant Team Physician to the Minnesota Vikings and Timberwolves. He currently serves as Team Physician for Joel Barlow High School in Redding. He is board certified by the American Board of Orthopedic Surgery and is a member of the American Orthopedic Society for Sports Medicine, the American Academy of Orthopedic Surgeons, and the Arthroscopy Association of North America. This entry was posted in Shoulder, Sports Medicine and tagged Danbury Orthopedics, Dr. Albert Diaz, OrthoConnecticut, Overuse injury, shoulder joint pain, Sports Medicine Specialist, The Sports Medicine Center on June 18, 2017 by bbrand. DANBURY, CT – Danbury Orthopedics is pleased to announce that J. Albert Diaz, M.D., will join the practice as of June 1st. A specialist in the field of sports medicine, minimally invasive arthroscopic shoulder and knee surgery, Dr. Diaz completed his orthopedic residency training at The Hospital for Special Surgery in New York City, and his sports medicine fellowship at the Minneapolis Sports Medicine Center where he served as Assistant Team Physician to the Minnesota Vikings and Timberwolves. He attended Dartmouth College and the Tulane University School of Medicine, and currently serves as Team Physician for Joel Barlow High School in Redding. Dr. Diaz is board certified by the American Board of Orthopaedic Surgery and is a member of the American Orthopaedic Society for Sports Medicine, the American Academy of Orthopaedic Surgeons, and the Arthroscopy Association of North America. 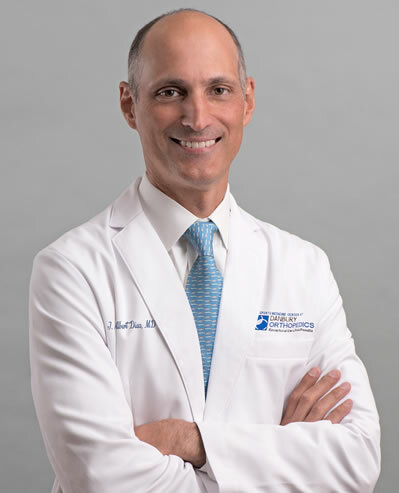 He maintains surgical privileges at Danbury Hospital, Danbury Surgical Center and Western Connecticut Orthopedic Surgical Center. “I am delighted to bring my skills to the highly trained team at Danbury Orthopedics, and continue to care for patients in the greater Danbury area,” says Dr. Diaz. “This organization has made significant advancements to meet the needs of the modern orthopedic patient and I am excited to be a part of it,” adds Dr. Diaz. Danbury Orthopedics offers the full suite of orthopedic services, including the highest quality diagnostics, non-operative and surgical treatment solutions, integrated care by its physical therapy team, its own orthopedic-only outpatient surgical center, and OrthoCare Express, a walk-in orthopedic specific urgent care service, 7 days a week. This entry was posted in General, Sports Medicine and tagged Danbury CT, Danbury Orthopedics, Dr. Albert Diaz, J. Albert Diaz, M.D., OrthoCare Express, OrthoConnecticut, Sports Medicine Specialist on May 24, 2016 by bbrand.